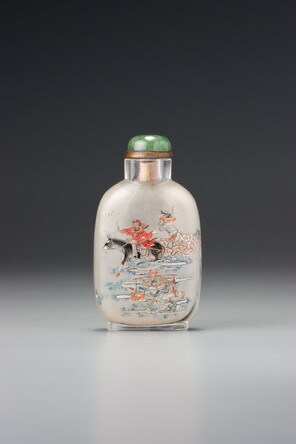 The legend of Zhong Kui began, as so many legends did, with a human who was deified after his death (see under Sale 4, lot 79). In one embellishment of the story, after his death he had his sister marry the man who had been his old benefactor, as well as seeing that she was taken care of while he was away. Here she is shown in her wedding procession, being accompanied by her brother and demon-attendants. On a subtler level, the theme ‘Zhong Kui marrying off his sister’ (Zhong Kui jiamei) can also be interpreted as a visual pun for the term jiamei (‘to be rid of evil spirits’). Such a design conveys the desire for smooth sailing in daily life. 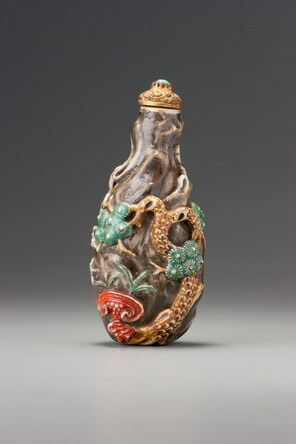 For other works by Sun Xingwu, see the commentary on this bottle in Treasury 4.